HappyFox Chat is the ideal live chat and customer support app for a variety of businesses, which helps users streamline customer relationships, and provide a whole new and advanced customer experience. HappyFox Chat is a pretty simple and usable app, which nevertheless comes packed with useful live chat and automation features, a variety of seamless integrations to make it blend inside your software infrastructure, and the obvious and compulsory flexible pricing which makes it accessible to pretty much every user out there. The main rationale behind HappyFox Chat was enabling fast support, which is exactly what the developers did so far. Agents take no more than few minutes to recognize customers and connect to them, sending automated, yet personalized messages. They are able to control the interaction flow because they have an insight on visitors’ behavior, and access to a robust database where all visitor information is being stored in advance. To make matters even better, HappyFox Chat is fully mobile optimized, and you can use it wherever you are, at any time. There are many ways to answer the question of why HappyFox Chat could be useful to your business, and live chat is only one of them. The reason why so many prominent companies choose to entrust their customer support to this provider is that they enjoy its simplified navigation, understandable dashboards, and above all – the extremelly high level of customization and personalization it provides. If you want to drill deeper, you will discover that you’re working with a tool that can be your CRM, marketing automation system, and project manager all in one. HappyFox Chat is a context driven app which revolutionized live chat, and turned it into something companies don’t simply have, but want to do as well. They are able to include all of their agents, and to provide them a private collaboration channel where they can cooperate to provide the best customer experience possible. Just a sneak peak at the detailed database will be enough for them to discover all relevant information about a visitor, and to approach him in the most appropriate way. Needless to say, customers feel taken care of, and issues are solved quickly and accurately. Besides, HappyFox Chat is not an app that will break the bank. If you’re a small company looking to maintain a modest support team, you can even use it for free. In case you decide to switch to an upper plan, the transition will be cheap, and painless, to put it that way. At the same time, you will enjoy a simplified set up procedure, where HappyFox Chat will simply click with Zapier, Zendesk, Sugar CRM, or whatever other app you’re using, and you won’t have to do anything about it. Since each enterprise has specific business requirements, it is prudent for them to desist from looking for a one-size-fits-all ideal software system. Needless to say, it would be pointless to try to find such a platform even among market-leading software applications. The intelligent thing to do would be to catalog the various important elements that need consideration such as required features, budget, skill levels of staff members, company size etc. Then, you should do your homework thoroughly. Read some HappyFox Chat reviews and check out each of the other solutions in your shortlist in detail. Such comprehensive research can make certain you weed out ill-fitting systems and select the solution that presents all the features you require for business success. How Much Does HappyFox Chat Cost? 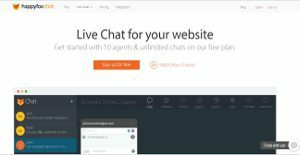 We realize that when you make a decision to buy Live Chat Software it’s important not only to see how experts evaluate it in their reviews, but also to find out if the real people and companies that buy it are actually satisfied with the product. That’s why we’ve created our behavior-based Customer Satisfaction Algorithm™ that gathers customer reviews, comments and HappyFox Chat reviews across a wide range of social media sites. The data is then presented in an easy to digest form showing how many people had positive and negative experience with HappyFox Chat. With that information at hand you should be equipped to make an informed buying decision that you won’t regret. What are HappyFox Chat pricing details? What integrations are available for HappyFox Chat? If you need more information about HappyFox Chat or you simply have a question let us know what you need and we’ll forward your request directly to the vendor.